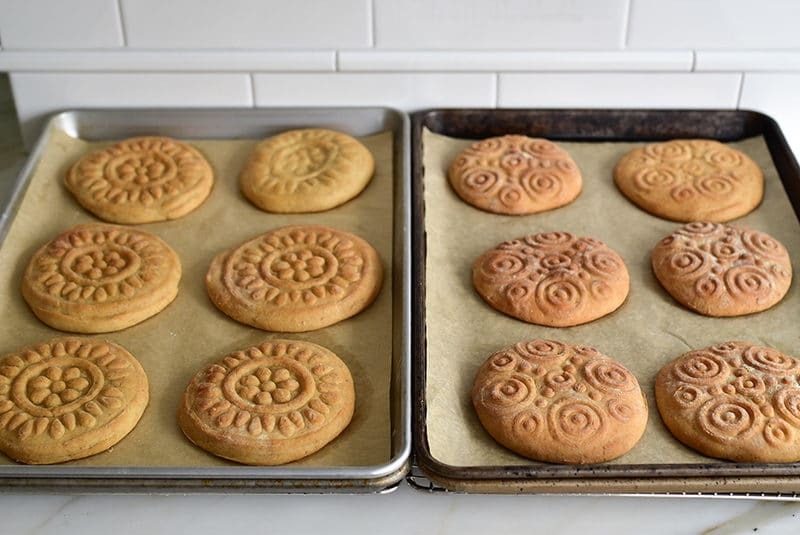 Tips for baking better Lebanese Ka’ik, a traditional yeasted Easter bread/cookie that is soft, flavorful, and sweet. For the beautiful molds made of solid walnut, and the Mymoune Rose Water, visit MaureenAboodMarket.com. I’ve shared with you before some of the confounding aspects of our beloved Lebanese ka’ik. I have asked (and continue to ask): is ka’ik a bread/yeasted donut? Or a cookie? Ka’ik is both; ka’ik is all. Crunchy biscuit. Soft, buttery sweet bread. And a pocket bread with hole for hanging on a hook, a version I saw in Lebanon filled with knafeh-to-go (my Lord, the Lebanese are a brilliant people), which we are tabling for a later time. Today our attention is on the soft, buttery sweet bread. The recipe that I rely on, as do many throughout the land if I dare say it, is handed down from my Danny’s mom and matriarch, Louise (a.k.a. “Aunt Louise”). Here is a tried and true recipe, a ka’ik recipe that has made Aunt Louise famous (yes, I still call my mother-in-law “Aunt.”) for baking the finest, buttery sweet bread ka’ik known to humankind. And here, I humbly submit, I have been working in the lab that is my kitchen to enhance her already-perfect recipe. Before the heavy hand of the Lord comes down upon me for my sacrilege, let me just say that I believe even this beautiful second mother of mine (who gets to have TWO beautiful mothers in their lives? My blessing is beyond!) would say that her ka’ik dough can be so darn finicky. I remember days when we’d stop over and Aunt Louise would be shaking her head over a batch of ka’ik, muttering “it didn’t rise . . . it didn’t rise.” Which was a total affront, given the warm blankets she laid out on the counter both under and over her dough. To further support my journey into new, improved ka’ik, I cite a recent visit to my cousin Celine. I casually mentioned, in our waterfall of hello-and-all-that-is-new conversation, that I’ve been working on the ka’ik recipe. Her big Lebanese eyes got bigger. She asked, would I be sharing those new tips with everyone? Cousin? It’s just that my dough doesn’t want to rise! She said. And we want it SWEETER! I said. It might be in the glaze, I’m playing with the glaze. I need more POP! of flavor! she said. Anise! Mahleb! Rose Glaze!, I said. Celine went on a riff about how there were so few sweets around when she was a kid, that she must have learned to love the semi-sweet ka’ik back then. Anything even sorta sweet, and that kid was gonna take what she could get and run. Add some dates as a filling? You never saw a kid love dates like she did come Easter, for lack of a Reese’s peanut butter egg anywhere to be found. I’ve made batch upon batch to confirm findings, to which Dan and Steven will attest: Bingo! Steven has said in hushed tones over the years, I’ve got to say, I don’t go crazy for the Easter cookies. The new and improved ka’ik, he took a little baggie of them home with him for second supper (more on that another time). Richard, the most discerning eater I know, dubbed the new ka’ik “soft and sweet like a donut.” Enough said. The dough. 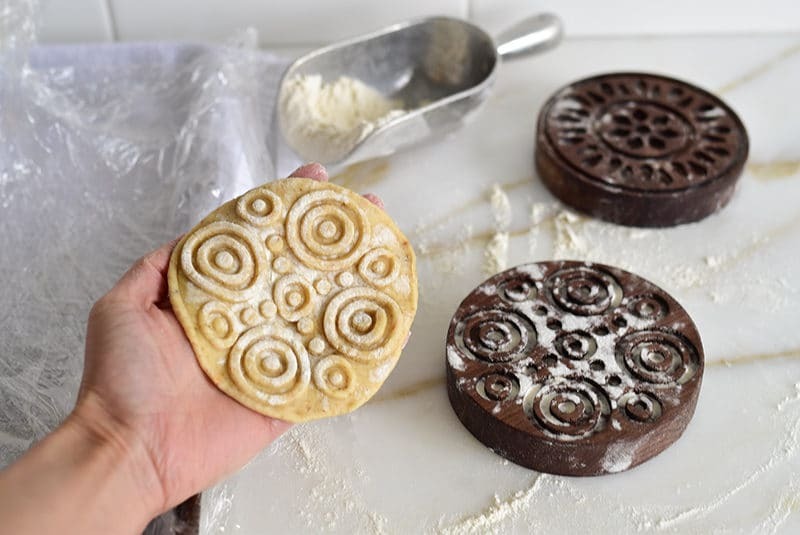 Ka’ik dough is a yeasted dough enriched with butter and milk and sugar. All of these ingredients actually inhibit the yeast’s ability to rise (the yeast in effect crashes drunk and tired on all of that fat and sugar, same way we can). Answer: Rapid Rise yeast and more of it, longer rise-time, indispensable warm rising environment. Alternatively, the dough rises beautifully overnight in the refrigerator, in which case, cut back in ½ tablespoon of the new yeast quantity. I love the overnight rise because it allows for freshly baked ka’ik in the morning, and there is nothing like ka’ik fresh, and now even softer with my enhancements. For the second rise, uncover the dough for the last 15 minutes or so of the rise. The slightly dry dough makes a better imprint in the mold. This enhanced dough overall is softer, so a bit of flour on the molds and dough helps release the dough from the mold. The flavors. I have doubled, even tripled the anise here and Dan still says, “did you add more anise?” I’ll thank my own mom, whose devotion to licorice flavor is stellar, for the little bottle of Pure Anise Extract I found in her spice drawer recently. Add this to the mix along with freshly ground anise, and the ka’ik flavor boost is perfect. Now, Mom’s is one oooooold bottle of anise extract, from a time when you could find anise extract in the grocery aisle. Not so today. So if you don’t want to wait to order your anise extract online, grab a bottle of Arak or Ouzo, which work equally as well for added anise flavor. The mahleb, the ground kernel of the St. Lucy cherry pit, is our little kernel of sweet, aromatic almond-like flavor. This flavor is double-worthy. Note that the mahleb must be fresh; mahleb goes rancid in about a nano-second, so check the date on yours. I know mahleb can be difficult to find, so I’m looking at offering it at MaureenAboodMarket.com. If needed, replace the mahleb for 1/8 teaspoon almond extract. The glaze. My initial glaze experiments were primarily about simply adding sweetness to the ka’ik, until Celine mentioned wanting a glaze that hardens a bit, for the ability to stack the ka’ik. I’ve tested everything from simple syrup glazes to royal icing, and I’ve landed on a confectioners’ sugar glaze, full of rose water aroma (but not overpowering in any way), that shines and hardens to a perfect Easter-joy level. The key here is adding a touch of corn syrup, which rest assured, in home cooking is not the bad-boy high-fructose corn syrup. 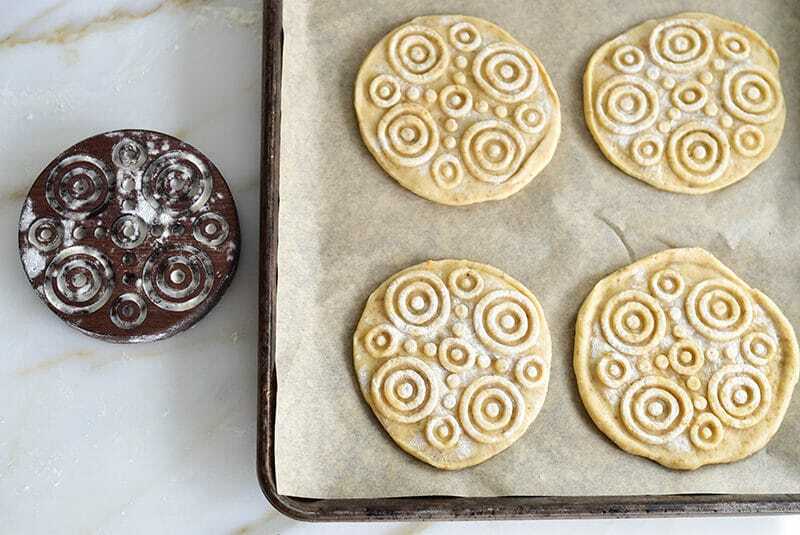 Still, even with the harder glaze, take care when stacking the cookies; the top is still delicate and requires a layer of wax paper between. The long rise, both for the first and second proofs, is essential. 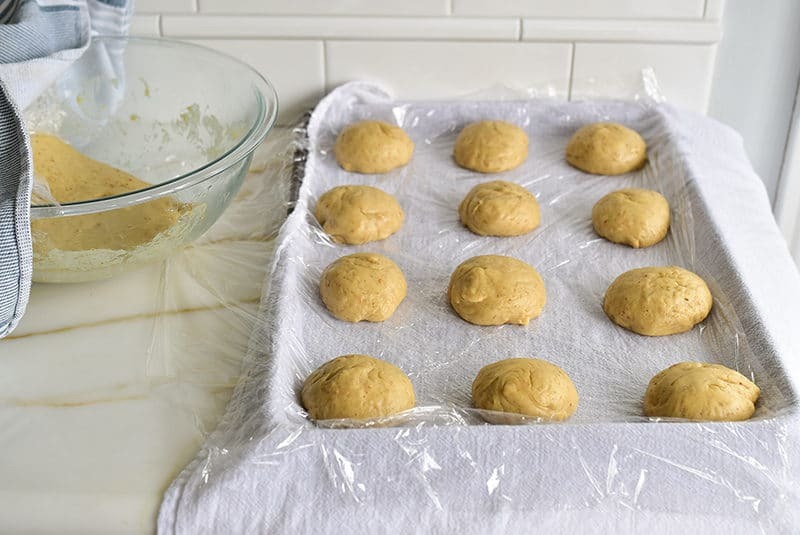 To do the first rise overnight in the refrigerator, pull back to 1 ½ tablespoons yeast, cover the dough as usual, and chill in the refrigerator for about 8 hours. Proceed with making the balls, and let them rise in a warm spot until doubled, about an hour. To fill the ka'ik with date paste, see the method here. Note the molded imprint is not quite as defined when the cookie is filled. Proof the yeast by dissolving it in 1/4 cup of warm water with a tablespoon of the sugar. After about 10 minutes, the yeast will activate, becoming creamy and foamy. Warm the clarified butter and milk in a small saucepan over low heat or in the microwave just until the butter is melted. 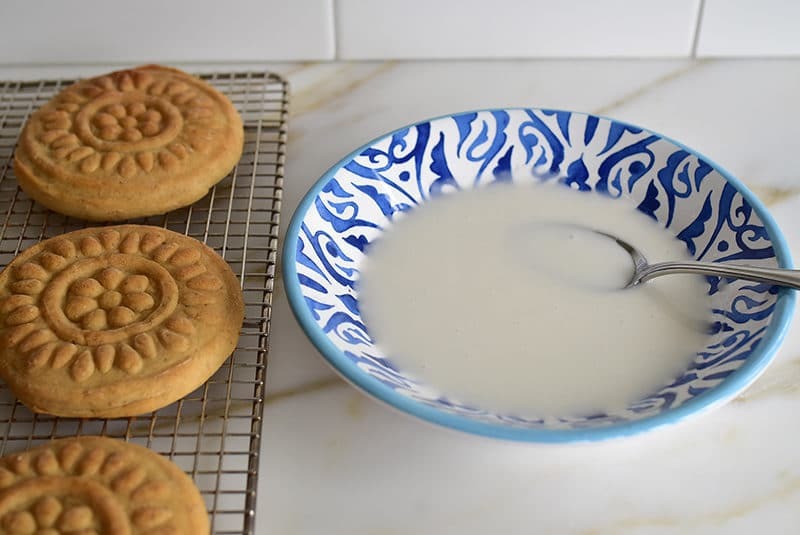 In the bowl of a stand mixer fitted with the hook attachment, or by hand in a large bowl, combine the yeast mixture with the remaining cup of sugar, flour, mahleb, anise, arak, nutmeg, sesame seeds, and salt. Slowly add the butter and milk and mix on low speed or by hand until dough forms. Increase the speed on the mixer to knead the dough for eight minutes, or by hand on the counter for 10 minutes. Lightly oil a large bowl with the olive oil. 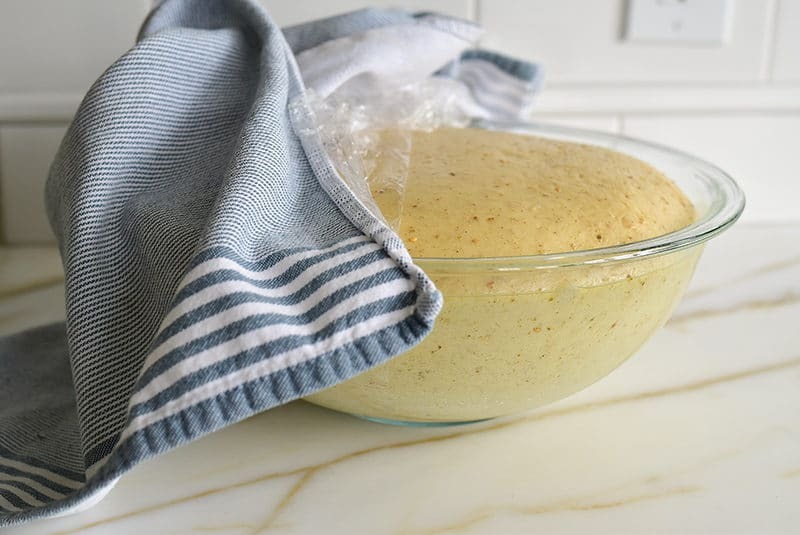 Coat the dough in the bowl and cover with plastic wrap, then a clean kitchen towel. Set the dough in a warm spot to rise until at least doubled in size, which can take 2 to 3 hours. To create a warm setting for the balls to rise again, place a kitchen or bread towel on the counter or on sheet pans and cover with plastic wrap. Divide the dough into 18 pieces by cutting or squeezing off balls about 2 ½ inches wide (the size can be larger or smaller, to your liking). Place the balls on this about 2 inches apart, cover with more plastic wrap and another towel. Let the balls rise for 30 minutes, uncovering the dough for the last 15 minutes. Heat the oven to 325 degrees, with a rack in the center of the oven. Line two sheet pans with parchment paper and if you have more sheet pans, double the pans to prevent overbaking the bottom of the ka'ik. Dust the counter and molds lightly with flour. Take a dough ball and lightly coat it with flour, flattening the dough into a flat circle. Press the dough into the mold with some force numerous times without lifting the dough from the mold, and pushing the dough up that falls over the edges as you go. To unmold the dough, use gravity as your friend and turn the mold over. Gently peel the dough away from the edges and it will fall out into your hand. Repeat this process with the remaining dough, baking six at a time per pan, then re-using the pans and parchment once they are finished. If using your hands to shape the dough, flatten each ball with the palm of your hand. Pinch the edges five or six times around the circle and poke with the tines of a fork over the top. Place on the prepared sheet pans. Bake the ka'ik for 25-30 minutes, until golden brown. Transfer the ka'ik to cooling racks until cool. Place parchment paper under the cooling racks to catch the glaze drips. 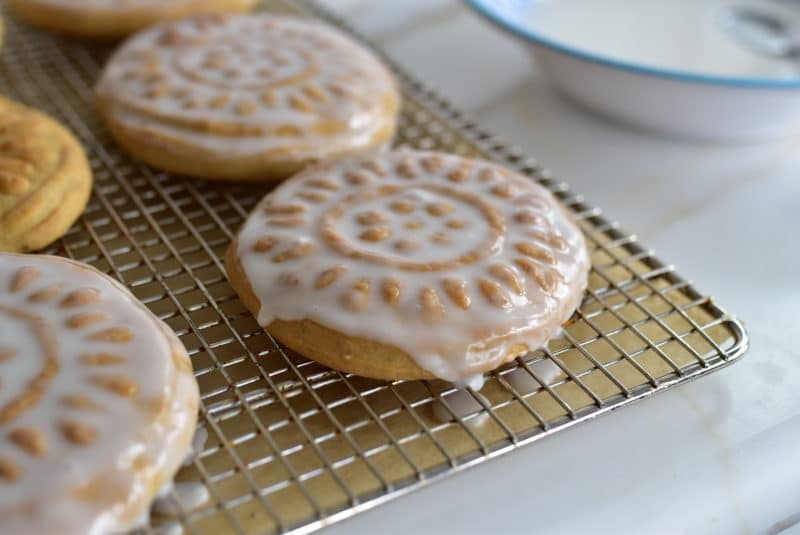 Make the glaze while ka’ik bakes. Combine the confectioners' sugar with rose water, water, and corn syrup, stirring until the glaze falls in a ribbon off of the spoon. Add drops of water if needed to get the correct consistency. Cover with plastic wrap until you're ready to use the glaze, stirring again to smooth it out. Dip the tops of the ka'ik in the glaze, letting the excess glaze run off of the ka'ik back into the bowl. Place the ka'ik back on the racks and let the glaze harden for at least one hour. Serve immediately, or store in airtight containers for up to 5 days. The cookies will not be as soft over time, which is perfect for dipping them in coffee. To soften them, warm them in the microwave for 15-20 seconds right before serving. 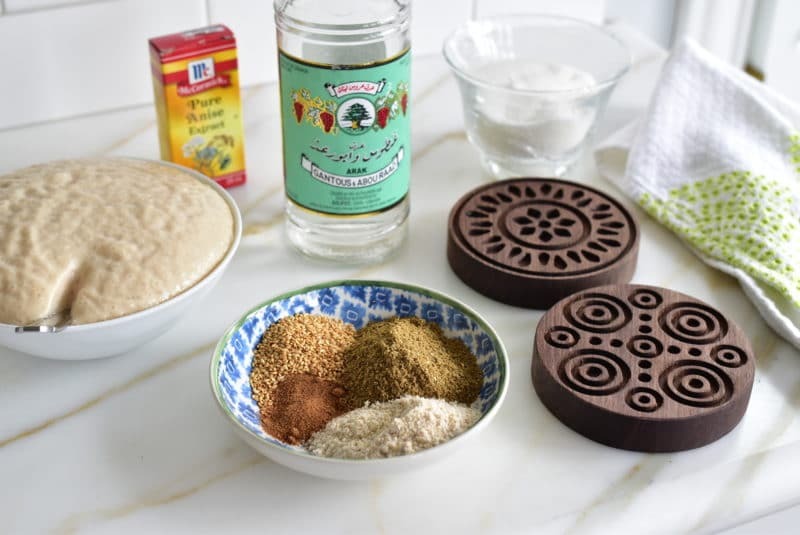 14 Responses to "Tips for a Better Lebanese Ka’ik Recipe"
I’m excited to try this. 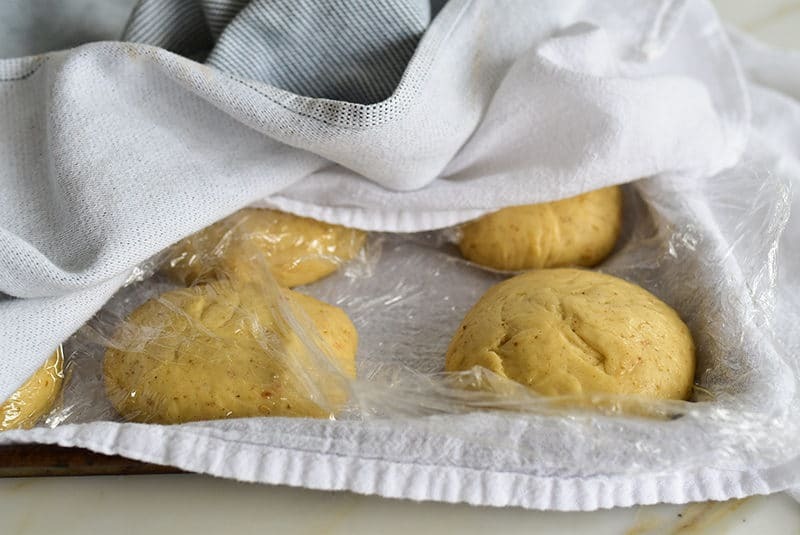 If you do the overnight method do you put the dough in the refrigerator immediately after it’s mixed or does it need to sit on the counter first? Thanks! Oh good Holly! For overnight, go direct to the refrigerator after you make the dough and be sure to cut back on the yeast. Love to hear how it goes! Just when I had resolved that we were going to eat all the cookies and desserts already in the freezer before I did any more baking. Dear Maureen,I have been researching kaik recipes. With my sister for so long! My Dad’s aunt made a moist, spongy one that I long to duplicate but have had no success ! She died many years ago and. no one knew her recipe! She was fro Aita Lebanon! I am feeling better and eager to try your recipe! Blessings! Love to read your recipes! Oh wonderful Marcia! I hope this recipe reminds you of your aunt’s. Keep me posted! Does this new recipe still produce a sweet bread vs a cookie? Timely posting – thanks! Carol, these are soft little yeasted breads; they are more of a yeasted donut-style than a cookie. This makes me very happy cousin! Thank you and love to hear how your baking goes! Hi Ellis, absolutely–the recipe in my cookbook and here online is here. Bless you Cuzzy! Your enhanced recipe is a HIT! 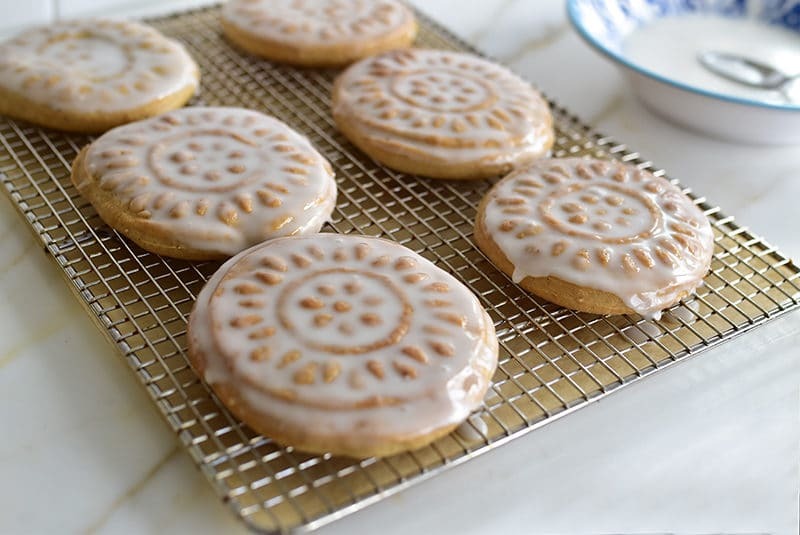 I just finished baking and glazing my first batch and I can wholeheartedly attest that you nailed the POP of anise flavor we were looking for with the same yummy texture as the original. Good news- I found McCormick Pure Anise Extract at our Meijer store. The best part is the glaze, which is exactly what I’ve craved all these years. This cookie went from good to GREAT with every enhancement you made. Paul’s reaction after one bite was a resounding “Mmmmmmm, those are the best!” I couldn’t agree more. I love this!!!! Thank you and how great that the Anise extract was available at the grocery store! !